How often do you surf? Everyday? Once a month? Let’s say you surf for two hours a session, once a week. After 50 weeks….that’s 100 hours a year. After ten years, you surfed approximately 1000 hours? According to the January, 2007 issue of the American Journal of Sports Medicine you can look forward to about 13 acute injuries for every 1000 hours surfed. If you surf one day a week for two hours on a rock bottom break or in overhead waves, then you will reach the 13 acute injuries in about 4 years. If you are lucky enough to surf 4 days a week for two hours in overhead waves, then you will reach the 13 acute injuries in about a year. If this is you, email me immediately so I can dial in your secret spot. The point: surf injuries are inevitable. Lacerations, contusions, sprains/strains, and fractures are medical problems you should be ready to quickly conquer in order to return to the waves. 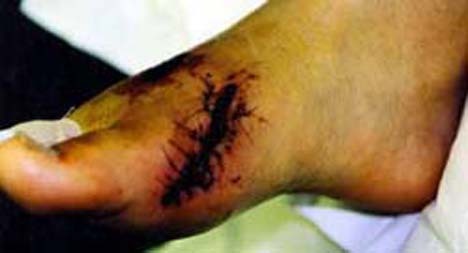 One acute injury you might overcome with a little help is the laceration. A ‘lac’ is a cut. I have had a few from surfing, a couple of times my fin caught my leg and once I kicked out and my fin found my head. Talented? The worst lacs are from loose boards bonking other surfers, perhaps the reason for more helmets in the line up. The site of blood oozing down your buddy’s face is a little frightening, but easily handled. What to do? Well, even if the waves are good, any size laceration deserves a trip to the shore. What next? Find a clean towel, and hold pressure directly on the cut. Early on in surgery training you learn the expression, “All bleeding stops.” It really does. Hold the towel firmly on the laceration for five minutes. The trick here is to apply significant pressure directly to the wound and not to peek. This direct pressure should allow the blood’s coagulation factors to go to work. If the cut is small to moderate in size then the bleeding should reduce to a trickle. A large laceration deserves immediate attention by the Emergency Department. Here is a trick for managing the smaller cuts.Physicians discovered the magic of Cyanoacrylate or crazy glue for repairing lacerations in the 1970s. Repairing a small cut on the chin of a four-year old with sutures is like scrapping with a Tasmanian Devil. Traditionally, you inject local anesthetic which feels like a bee sting until the chin goes numb. Then take another needle and try to sew the skin edges together. Little groms are mighty strong when faced with needles. Most kids require restraint by their parents; some are placed in a straight jacket or even given sedation (the kids not the parents). If the bleeding stopped and the wound is dry, crazy glue could quickly bring the skin edges together as good as sutures without the needles. Physicians were taking a risk by using crazy glue because of the lack of FDA approval but many swore by it. Of note, this wound care technology advanced during the Vietnam War when a spray version was used to prevent exsanguinations in soldiers with heavy injuries during the golden hour transport to medical care. Repairing a small cut on the chin of a four-year old with sutures is like scrapping with a Tasmanian Devil. Traditionally, you inject local anesthetic which feels like a bee sting until the chin goes numb. Then take another needle and try to sew the skin edges together. Little groms are mighty strong when faced with needles. Most kids require restraint by their parents; some are placed in a straight jacket or even given sedation (the kids not the parents). Does it work with surfer’s cuts? Absolutely. Some years went by and the products Dermabond and Liquid Bandage were ‘crazy glues’ approved by the FDA. Both are fantastic with children; tell the kiddies a magical potion will fix the cut without needles and no more tears. Does it work with surfer’s tears? Absolutely Bring the edges together of a clean, dry cut and apply the adhesive. One person can apply the product and one can push the skin together. For moderate size cuts, allow the skin to dry for 5 – 10 second and then reapply. Keep your hands far away from the wound; if the adhesive sticks to your hands during application then you will cause the wound to open when you pry your hands off. My patients can shower 24 hours after Dermabond application but should stay out of the ocean for a week. And definitely don’t rub the cut because it will open up. What can you do if you are ‘trapped’ on Tavarua with a laceration and your buddies are still surfing? Try crazy glue, it does work. Be sure to get checked when returning to civilization, lacerations have a habit of becoming infected. As a warning for the super adventurous without medical training, a memorable patient of mine after a two-week heroin binge presented with a superinfection of her left arm requiring amputation along with chest wall debridement. Definitely seek medical advice for large wounds. What happens when a small surf lac is ignored? Look to the email bag. Dear Dr. Jude,A hole in my wetsuit led to a cut in my knee. This cut steadily gets wider & deeper everyday. As i get out of the water the scab that formed over the day and night is gone by the end of the morning session. I have been told these are referred to as Sea Ulcer. 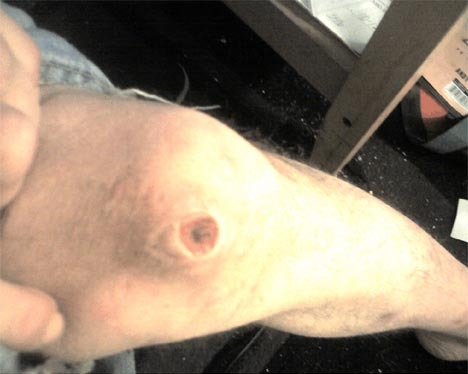 It seems that even keeping covered and Neosporin healing effects are not enough to heal or stop the cut from growing. I have tried to stay out of the water and went 4 days but then overhead waves won out and in one session basically right back to where… Is their anything I can so that doesn’t involve a 2 week prison sentence on dry land? A small cut that was properly treated with skin glue could have avoided the ulcer pictured. Staying out of the water a couple of weeks is the first step and might be all that is necessary. The location on the knee could indicate an infection in the tissue underneath, which can lead to a ‘septic joint’. A septic joint can cause mobility issues for years. Treat this wound with caution and see a physician if it remains after a week on dry land. Also, diabetics are at a greater risk for underlying infections and if this is you, seek immediate evaluation of ulcers like this. Oh yeah, during dry land prison sentences remember to take your suit in for a repair. Dr. Judeemail Dr. Jude with your questions.